Inspired by a host of design genres, from arts and crafts to modern industrial, the contemporary kitchen presents virtually unlimited opportunities to express your individuality. 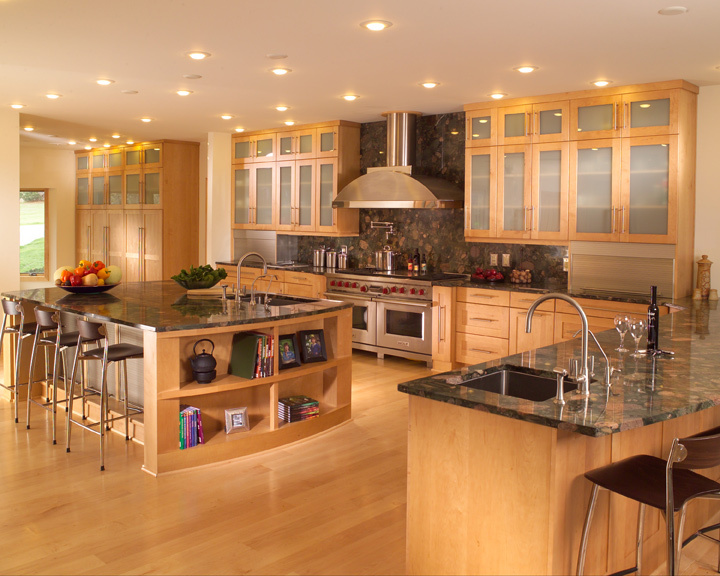 Consulted by Glen Alspaugh Kitchens & Baths, Baygents Company, Marc Christian Fine Cabinetry, Beck/Allen Cabinetry, National Kitchen & Bath and Cabinetry by Design. Mid-Century Modern. Artesio Walnut, by Poggenpohl. Modern Industrial. Almic blue, by Crestwood. Modern Industrial. Expressions, by Wood-Mode. International. Modern History, by Wood-Mode. Transitional/Eclectic. American Transitions, by William Ohs. Contemporary. Soft contemporary, Designer Choice Style, by William Ohs. 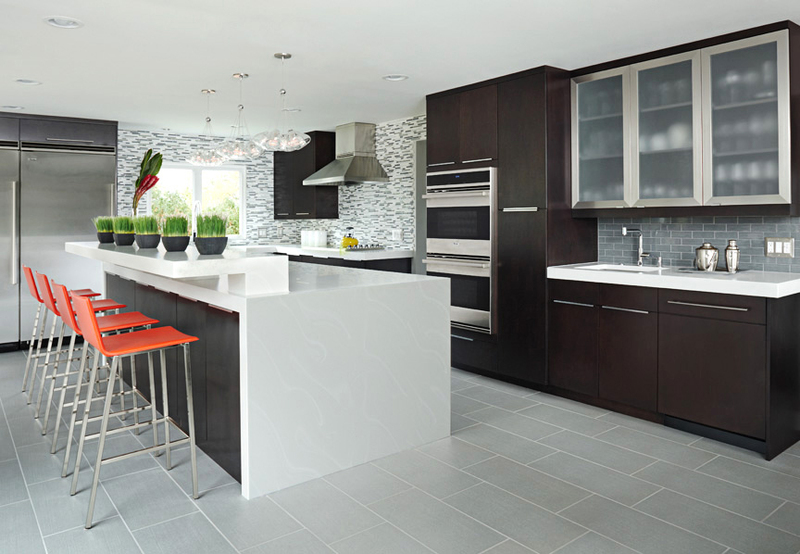 Inspired by a host of design genres, from arts and crafts to modern industrial, the contemporary kitchen presents virtually unlimited opportunities to express your individuality. 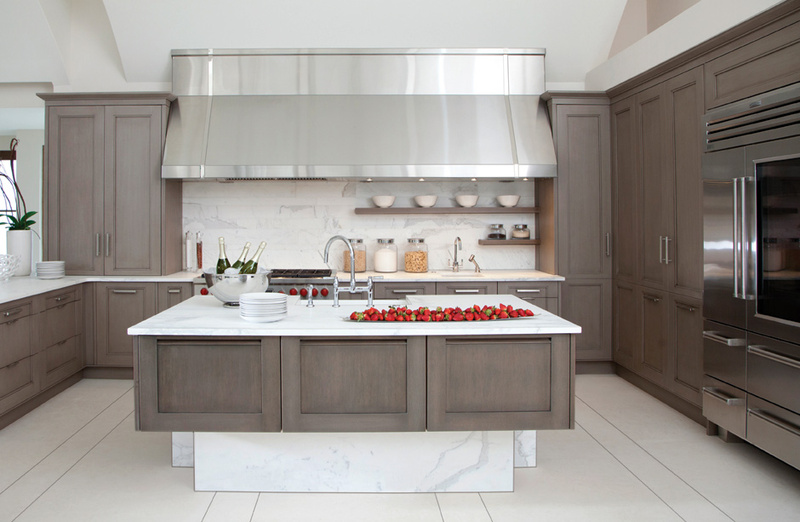 Although trends change rapidly, cabinetry remains the foundation of today’s well-designed kitchen. Many authorities trace the origin of modern cabinet styling to the Biedermeier period (1815-1848). Based on utilitarian principles and geometric shapes, Biedermeier was a simplified interpretation of French Empire design that shunned excessive ornamentation and the dark formality of mahogany in favor of cherry, ash, oak and walnut. Simple and functional, as well as beautiful, the style regained popularity following World War II. Since the 1940s, contemporary design has reflected strong European influences, particularly Italian, German and Scandinavian, but today’s open-plan kitchens – fully visible from living spaces – have become increasingly eclectic and international in style. Influenced by Scandinavian design. Form is as important as function. Spanned the transition from organic to man-made materials (stainless steel, laminates). Lack of molding and ornamentation. Unembellished, straight lines, symmetry. Neutral colors. Frameless, slab cabinet doors. Full overlay, stain or paint, teak, cherry or maple. Photography courtesy of Poggenpohl. No-frills, raw utilitarian style. Clean lines, natural materials, muted colors. Contemporary fixtures and materials can be mixed with antique pieces for a slightly rough, pleasantly “unfinished” look. Photography courtesy of Crestwood and Wood-Mode. Minimalist Asian design, such as Mizuki, currently popular. Assorted materials, from stainless and chrome to bamboo and maple. Geometric lines blend well with Western styles, from Craftsman to contemporary. Works equally well with black painted Shaker or shoji doors. 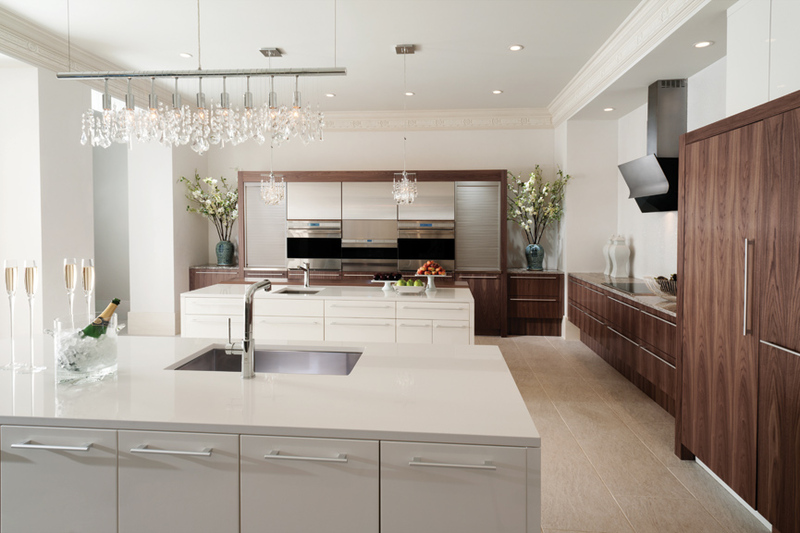 Just a few short years ago, stark whites, exotic veneers, polished chrome and the reintroduction of handles were au courant in European kitchen styling. The latest contemporary designs from Europe, however, are becoming increasingly eclectic, with colors and materials combined freely. 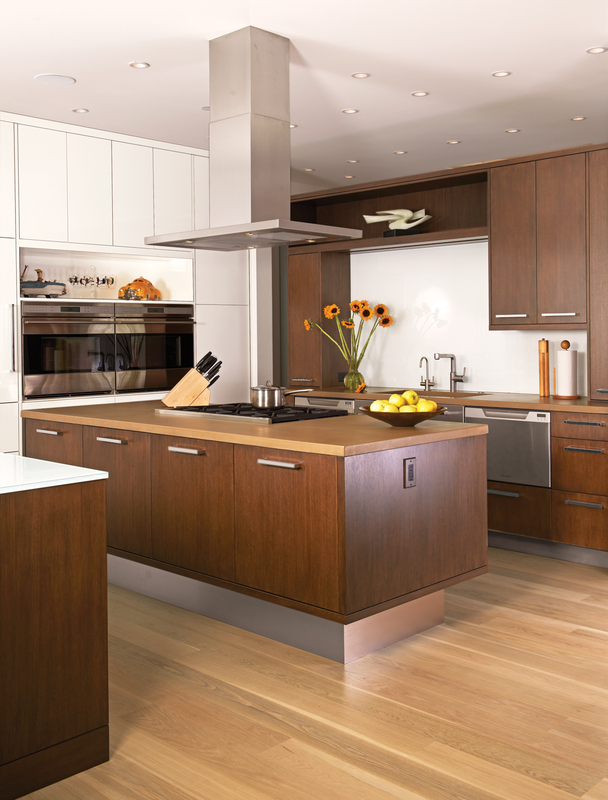 Unmatched cabinetry mixes woods with glossy materials, darker base with lighter upper cabinets, and limed oak is making a comeback. 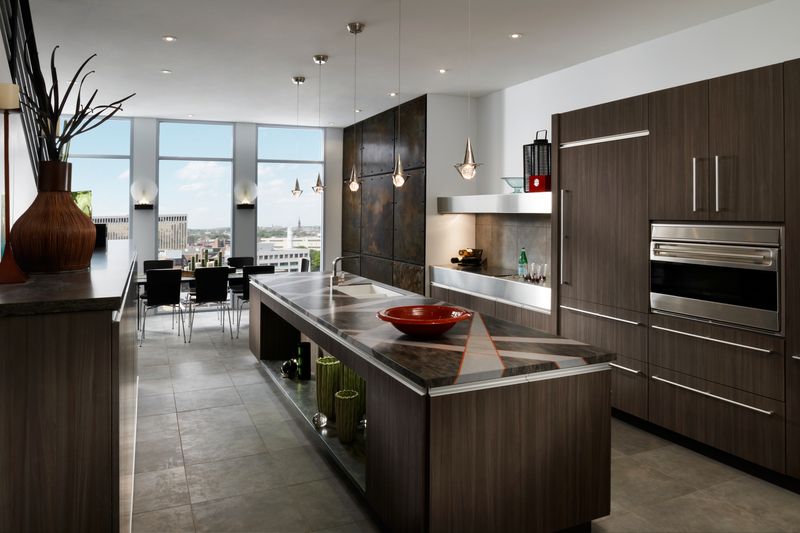 Cabinet pulls and knobs are invisible, and metal finishes are changing, as well, with graphite and oil-rubbed bronze taking preference over stainless steel. Photography courtesy of Poggenpohl and Wood-Mode. 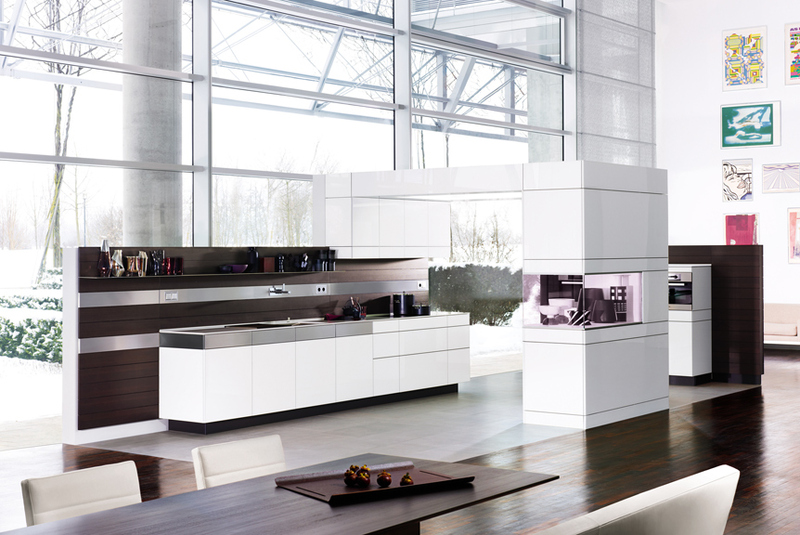 Harmonizes the warmth of traditional design with the sleek profiles, understated colors of contemporary styling. Warm neutrals, accented with chocolate or espresso. 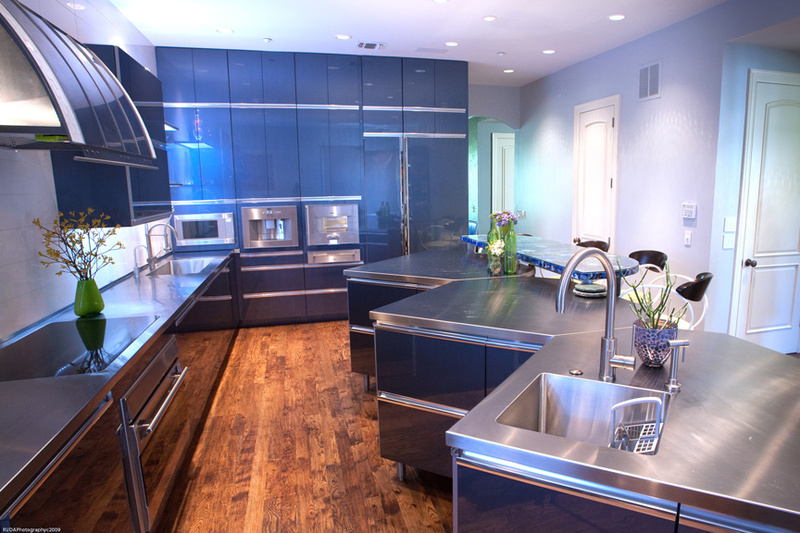 Invites contrast – gentle curves with rigid lines, traditional materials with stainless steel, paneled cabinets with minimalist hardware. Wood finishes can be light, mid-range or dark. Photography courtesy of Crestwood and William Ohs. Streamlined, but embraces curves. Sleek, smooth surfaces. Allows for asymmetry and variation. 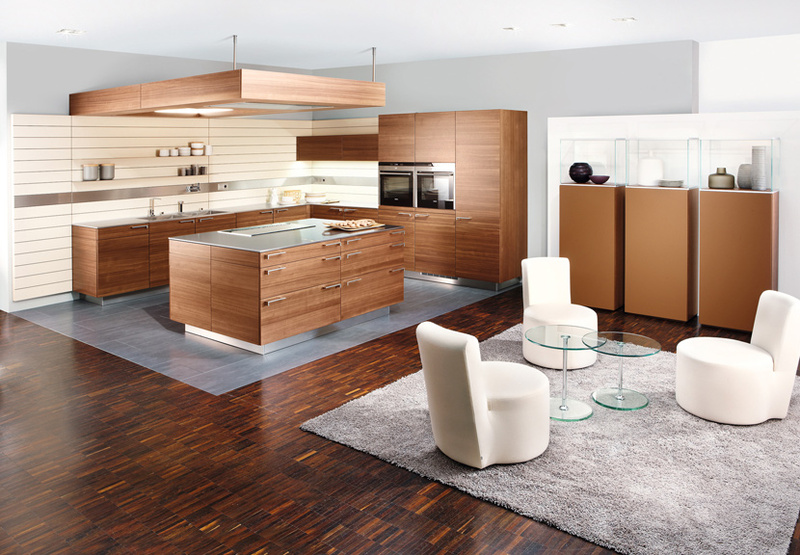 Wide range of materials and finishes – stainless steel, chrome, frosted glass inserts, high-gloss materials and laminates, natural woods and horizontal grains, exotic veneers. Monochromatic or bold color schemes. Full overlay slab panel doors and drawer fronts, pole pulls. Can be integrated with Shaker, Mission and Scandinavian styles. Photography courtesy of Williams Ohs and Bremtown.